Wednesday, September 6, 1995, was not a dark and stormy night. Instead, it was one of those gorgeous evenings that Lake Gaston residents are so used to. A party was going on. During the party one of the group suggested that they should have a meeting every now and then to talk about mutual computer problems. That idea immediately blossomed into the thought that there must be others in the area with the same interest. From those seeds, the idea of a local Computer Club was born. They believed that the more computer users got together to talk about computers, the more they would learn from each other. So, this is where the history of the LGCC began. The first meeting was held on Tuesday, January 9, 1996. There were eight people present. They decided to call themselves the Lake Gaston Computer Users Group. By the end of the year, the Club had grown from the original 8 to about 30, with an average attendance at each meeting of about 15. In 1998 the users group began having their general meetings at the Littleton Community Center. Because the Club was now collecting money from dues, it was necessary to establish a more formal organizational structure. In July, 1999, the name of the Club was changed to The Lake Gaston Computer Club (“Club”), a bank account was opened to account for the funds, an IRS account number was obtained for tax purposes, and a Post Office box was rented in the name of the Club. In January, 2000 our paid membership was about 110 and our average attendance at regular meetings was about 60. By the end of the year 2000, our membership was up to about 185 and average attendance at the meetings was about 90 members. In January 2002, there were 260 paid members. During the year the Club continued to expand both its membership and its activities. At the end of the year, the Club had 300 members. The Club has continued to grow and prosper with assets of projectors and computers for the educational classes offered by the Educational Committee. With the establishment of the Club’s computer Repair Center this has been one of the busiest offerings for club members. The Club’s monthly meetings have proven to be educational, informational and enjoyed by members. In March 2011 the Club moved its general membership meetings from the Littleton Community Center into the new Lions Club Facility in Henrico, NC. By November 2011 Membership was at about 340 families. From meager beginnings, in 1995, the ideas of 8 people to start a computer club has grown into a large friendly group of computer folks getting together to hear about the use and development of computers through our general membership meetings, our educational classes and our very busy shop where numerous computers are fixed, software and security questions answered, and technical questions discussed every week! To provide a forum for members to interact and to exchange information, techniques, and knowledge relating to the use of computers. 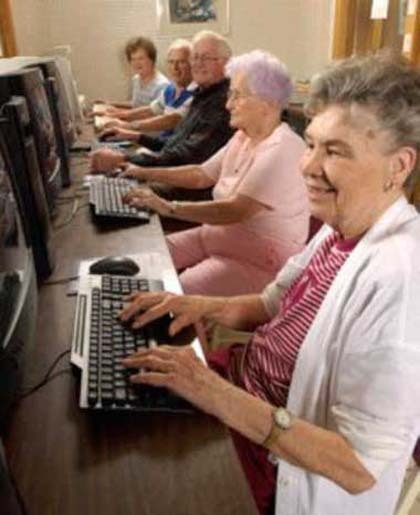 To provide programs, information, and activities designed to improve the computer-related skills and knowledge of the members. To provide direct technical assistance to members to aid them in solving problems they experience with the operation of their computers. To initiate and conduct computer related projects and activities of an educational and charitable nature in support of the community interest in the Lake Gaston area.